I started playing Elder Scrolls Online a while back with a friend of mine. I definitely enjoy this game a lot and have had a Logitech G13 profile for it for a long time. It just took me a while to post it because I lost it during a windows 10 upgrade and then life happened since then. Now that I got life some what under control I figured I should post it. 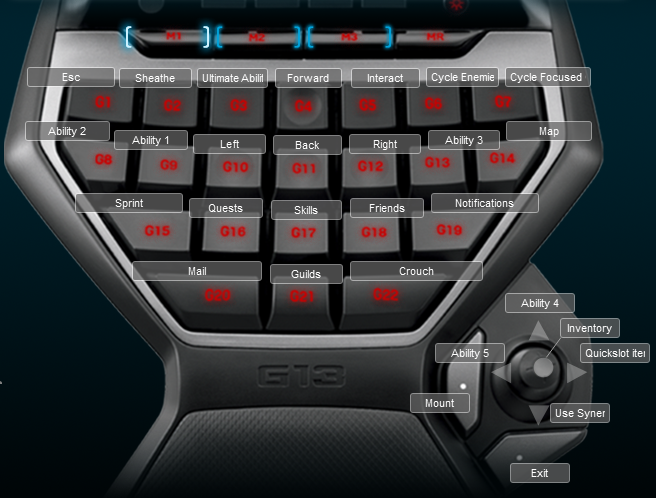 The layout is pretty close to most of my MMORPG keyboard layouts with movement in the middle, the power bar commands around those keys with interact being in the normal interact location for my rpg profiles to the right of forward. The nice thing about this game is it doesn’t have a lot of abilities so I am able to slot some other things like inventory and quests on the joystick or in easier to reach locations. Below is a screenshot of the keyboard layout.